Recall the discovery of iodine and its use as a means of preventing goiter, a gross enlargement of the thyroid gland in the neck. Iodine is essential for the synthesis of thyroid hormone, which regulates basal metabolism, growth, and development. Low iodine levels and consequently hypothyroidism has many signs and symptoms including fatigue, sensitivity to cold, constipation, weight gain, depression, and dry, itchy skin and paleness. 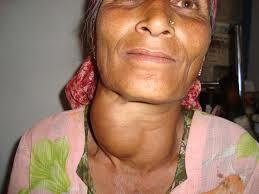 The development of goiter may often be the most visible sign of chronic iodine deficiency, but the consequences of low levels of thyroid hormone can be severe during infancy, childhood, and adolescence as it affects all stages of growth and development. Thyroid hormone plays a major role in brain development and growth and fetuses and infants with severe iodine deficiency develop a condition known as cretinism, in which physical and neurological impairment can be severe. 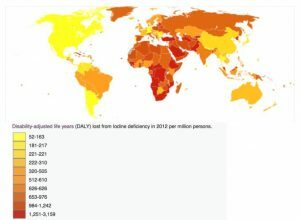 The World Health Organization (WHO) estimates iodine deficiency affects over two billion people worldwide and it is the number-one cause of preventable brain damage worldwide. Health Professional Fact Sheet: Iodine. National Institute of Health, Office of Dietary Supplements. https://ods.od.nih.gov/factsheets/Iodine-HealthProfessional/. Updated June 24, 2011. Accessed November 10, 2017. The mineral content of foods is greatly affected by the soil from which it grew, and thus geographic location is the primary determinant of the mineral content of foods. For instance, iodine comes mostly from seawater so the greater the distance from the sea the lesser the iodine content in the soil. Iodine by University of Hawai’i at Mānoa Food Science and Human Nutrition Program is licensed under a Creative Commons Attribution-NonCommercial-ShareAlike 4.0 International License, except where otherwise noted.